Be Part of the Mompreneur Manila Community. Click here for more details. 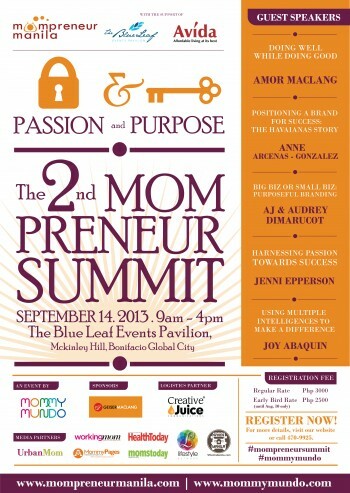 Mompreneur Manila supported by The Blue Leaf Events Pavilion and Avida proudly presents Passion and Purpose: The 2nd Mompreneur Summit on September 14, 2013 from 9am to 4pm at The Blue Leaf Events Pavilion, Mckinley Hill, Bonifacio Global City. This year’s theme, Passion and Purpose, aims to encourage and inspire mompreneurs to create and establish businesses created for a cause and founded with heart. These two driving forces are the keys behind every successful business—both of which are values innate to every mompreneur. The summit aims to help mompreneurs develop these values, helping them re-discover the passion to achieve something on top of being an active mom and successful homemaker, and uncover a greater purpose and a deeper, more meaningful motivational drive in finding fulfillment in their businesses through its impact on other people’s lives. Mompreneur Manila is also proud to announce that we are now accepting nominations for the 1st Mompreneur Awards. Nominate your most admired mompreneur in the first ever Mompreneur Awards by clicking here. We would like to thank the following partners and sponsors for supporting this event and our advocacy for mom entrepreneurship: GEISER MACLANG MARKETING COMMUNICATIONS, WORKING MOM MAGAZINE, CREATIVE JUICE COMMUNICATIONS, LIFESTYLE NETWORK, WHEN IN MANILA,and Mommy Mundo publications: URBAN MOM MAGAZINE and MOMMY PAGES. EARLY BIRD RATE until AUGUST 10, 2013: P2,500/person (EXTENDED UNTIL AUGUST 19, 2013). *fee is inclusive of a conference kit, lunch, and morning and afternoon snacks. SIGN UP FOR THE 2nd MOMPRENEUR SUMMIT NOW! Limited slots are available. REGISTER NOW by following the steps below. NOTE: BANK DEPOSITS will only be accepted until August 31, 2013 ONLY. After this date, registration and payments must be made through the Creative Juice office. For Paypal, you may settle fees by using the Paypal widget below. Kindly email a screenshot of your payment details to info@mompreneurmanila.com to confirm payment. Choose the rates from the drop-down menu (Rates are: 2,500 for Early Bird Registrations until Aug. 19, 2013 and 3,000 for the Regular Rate) and click on “Add To Cart”. For any questions, email info@momprenuermanila.com or call the conference secretariat at (02)4709925 or 0908-8657245.